Summary: Tess and her brother Max have just finished up a year at a Swiss boarding school, and are spending the summer with their Aunt Evie in the English countryside. They were sent abroad because their father is a journalist on assignment in Afghanistan and their mother is being treated for an undisclosed but life-threatening illness. Tess accidentally stumbles into the neighbor’s backyard, and meets William, a charming but seemingly otherworldly boy about her own age. She brings Max along to their next meeting, and William invites them for dinner. Aunt Evie is baffled by the invitation, certain that the house has long been abandoned. During their visit, Max accidentally falls into some hawthorn trees that William has warned them to stay away from, and all three children find themselves in grave danger. Tess is able to find courage and strength within herself to help them. 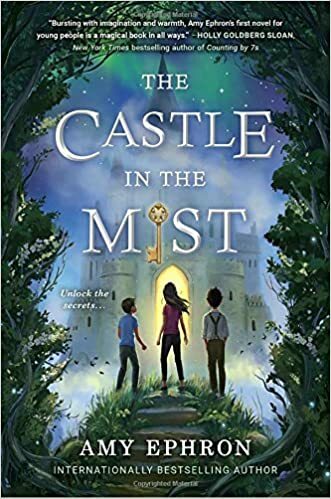 By the end of the story, Dad has returned, William and his servants and family have disappeared, and the mystery of who he was is cleared up with a visit to the castle, now turned into a secluded museum. 167 pages; grades 3-6. Pros: A quick read for fans of magic realism. The story unfolds at a good pace, dropping clues about William that reveal just enough to keep things interesting. Cons: The book is too brief to really create an interesting magical story. Reviews have compared it to E. Nesbit and Edward Eager. Please.